Landscape Bhutan: Hallucinogens…Happy Haloes, or Harmful Habits? Hallucinogens…Happy Haloes, or Harmful Habits? In the process of preparing our 5 acres around the building, to create the tree-studded sweeping lawns with their floriferous borders, much time has been spent on sculpting and leveling rocky ground, adding topsoil and particularly in removing weeds. And there are plenty of weeds, especially now with the warm summer and its accompanying monsoon rains upon us. One of the first sights that strikes visitors to Bhutan is the profusion of marijuana that grows literally everywhere. It’s probably this country’s most prolific weed. It thrives on roadsides, in home gardens and vegetable patches, on sports fields, in cracks in the footpaths, on vacant land and in the forests. I’ve even seen it growing in weedy gutters high on the roofs of buildings. It’s commonly collected and fed to the local pigs. Gives a new meaning to the old expression “when pigs fly”! In my teenage years I could never have imagined myself paying workers to hand-pull so many hundreds of square metres of this stuff and then pile it up for composting. "The flowers (and to a lesser extent the leaves, stems, and seeds) contain psychoactive and physiologically active chemical compounds known as cannabinoids that are consumed for recreational, medicinal, and spiritual purposes. When so used, preparations of flowers (marijuana) and leaves and preparations derived from resinous extract (hashish) are consumed by smoking, vaporizing and oral ingestion. Historically, tinctures, teas, and ointments have also been common preparations." At first I didn’t recognise this almost equally rampant plant that basically moves into and takes over any area not dominated by the aforementioned Cannabis. Artemisia is known in the local tongue as “khempa”, but is more commonly called “wormwood”. This plant is the basis of that most (in)famous of alcoholic brews, absinthe. (Incidentally, the herb tarragon that we commonly use in cooking is also an Artemisia...A.dracunculus). "It's perhaps one of the most legendary psychoactives historically among artists and Bohemians. 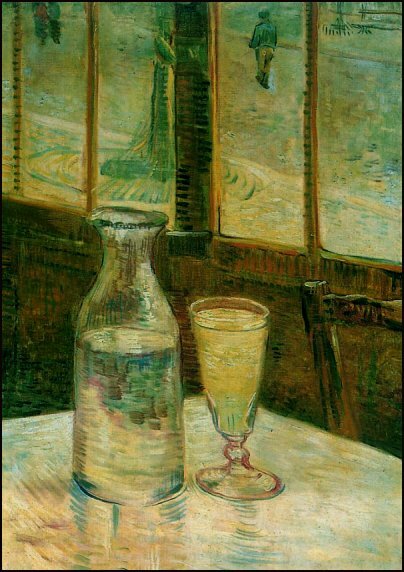 Manet and Toulouse-Lautrec are two famous painters who adored absinthe, but the ones many have heard about most are Picasso and Vincent Van Gogh. If one is looking for examples of the psychoactive effects of wormwood, look to Van Gogh’s paintings, and especially the ones that have plenty of yellow tones in them. And the fascination with Absinthe, Thujone, and Wormwood didn't end with painters. There are plenty of famous writers who felt that this amazing herb helped them pen some of the best-known novels of all time. Arthur Rimbaud, H.P. Lovecraft, Oscar Wilde, and Ernest Hemingway are but a few of this long list of writers. Many of them have even written poems in reverence for Absinthe." "Known by the common names Jimson weed, devil's trumpet, devil's weed, thorn apple, tolguacha, Jamestown weed, stinkweed, locoweed, datura, pricklyburr, devil's cucumber, Hell's Bells, moonflower and, in South Africa, malpitte and mad seeds, is a common weed in the Solanaceae (nightshade) family. Parts of the plant, especially the seeds and leaves, are sometimes used as a hallucinogen, specifically a deliriant. Due to the high risk of overdose in uninformed users, many hospitalizations, and some deaths, are reported from this use." Kezang...don't worry about the gardens getting dry...with the monsoons now, they're growing too fast! I have a new team starting Monday to help manicure them into sheer beauty.